This post was written for me by my editor, Chris Harris, who is also an expert on civic affairs. 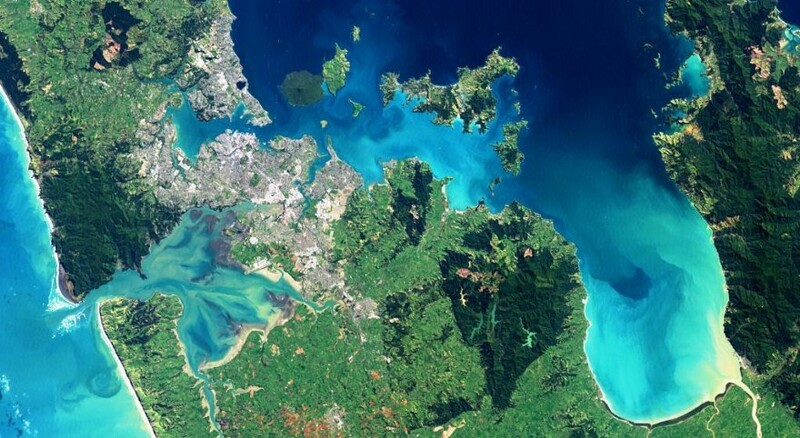 Auckland from Space. 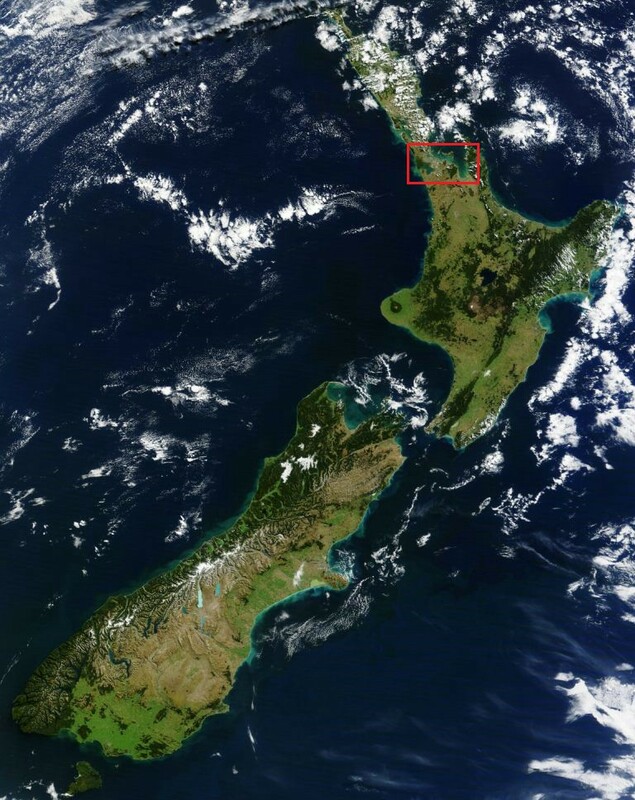 Satellite photography is from NASA Earth Observatory Image Auckland_17_2002239. North at top for this and the next three images. PEOPLE are perpetually fascinated by history as it might have been: by parallel universes and the plotlines of films like Sliding Doors. The location of Auckland (red box) in New Zealand. Satellite photography source: NASA Earth Observatory image 2010/099. Downtown Auckland and Waitematā Harbour. Imagery and Map Data ©2018 Google. 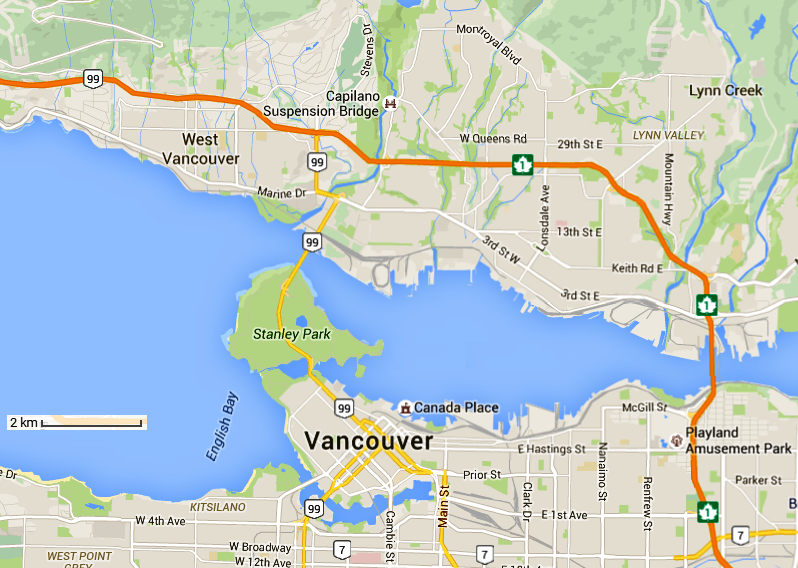 The Vancouver CBD is bypassed at some distance by the Trans-Canada Highway (shown by a Maple Leaf logo with the number “1”), the equivalent of New Zealand’s State Highway One, while the Lions Gate Bridge north of Stanley Park (on a route shown by a plain shield bearing the number “99”) has only three lanes. Map data ©2012 approx., Google. Just how parallel is Auckland? Consider this. The city centre is on the south side of a drowned valley called the Waitematā, Māori for ‘sparkling waters’; an arm of the sea that closely resembles Vancouver’s Burrard Inlet. A series of narrows separates downtown Auckland from its suburban North Shore. To the south of the city there is a muddier estuary, known as the Manukau. Between the two there are grid-pattern streets. The city includes a surprisingly wild coastal nature-park north of the Manukau Heads, where The Piano was filmed; a parallel to the mountains, parkland and skifields of Vancouver’s North Shore. Auckland is ethnically diverse, and its indigenous culture is conspicuous. The climate is rainy, and there was a building scandal in which thousands of apartments leaked and rotted. At the same time the city has been dogged by a runaway property-market bubble, just like Vancouver. 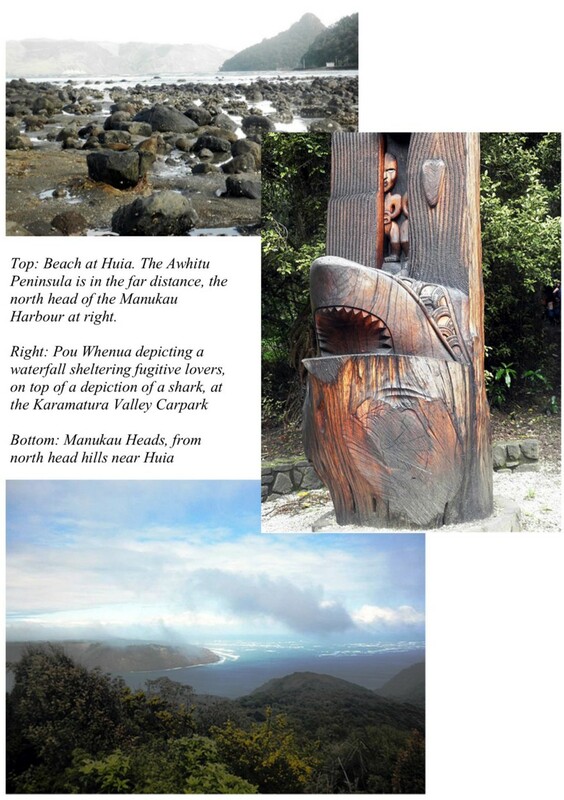 ‍West of Auckland: Scenes at Karamatura, Huia and the Manukau Heads, collage reproduced from A Maverick New Zealand Way. Off the eastern shore, there is a series of ecologically sensitive islands shielded from the wider Pacific by Great Barrier Island and the Coromandel Peninsula, both of which are still mostly covered in native forests. The parallel here is with Vancouver Island and other islands along the BC coast; a parallel that extends to Auckland’s rugged western shores as well. Founded in Vancouver, Greenpeace had its Rainbow Warrior blown up in Auckland Harbour. And both cities were founded and governed along somewhat similar British-Commonwealth lines, overall. Such are the parallels, which alone would make Auckland an interesting place for the Vancouverite to visit and vice versa. But there are differences too. Both cities are ethnically diverse. But Auckland is even more diverse than Vancouver. Alongside a large Asian community, New Zealand Māori and their Polynesian relatives make up an additional quarter of Auckland’s population. Such a First Nation presence is almost unique in a large Western city, as opposed to a rural district. Auckland is thus not only the largest city in Polynesia — much larger than Honolulu — but also the largest Polynesian city. Another difference lies in transport policy. 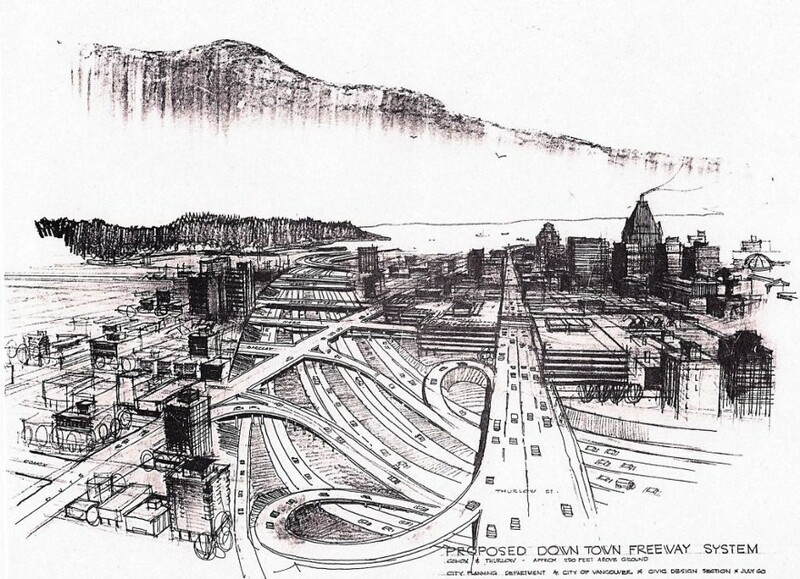 A story by John Mackie, published in the Vancouver Sun in January 2008, describes a 1960s scheme for a downtown freeway junction in Vancouver, of which a couple of sketches from back in the day (also depicted in Mackie’s story) are shown here. Proposed downtown Vancouver motorway trench and bridges, 1960. North Shore in background, looking northward, Stanley Park between city and North Shore. Source: Slide 9 from City Planning Department archives, microfiche copies, chronological set, 137-F-2 1960 B1469. Courtesy of the City of Vancouver Archives. 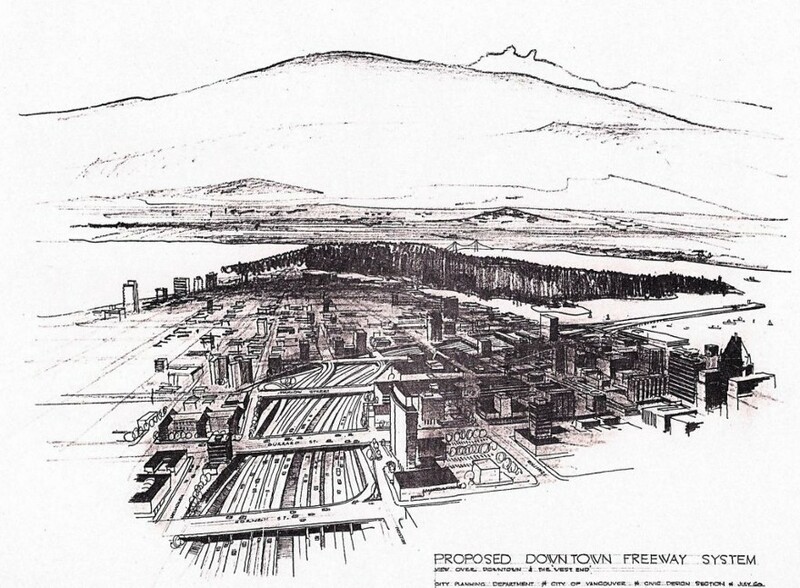 Another 1960-vintage sketch of the proposed downtown motorways in Vancouver, looking more northwestward. Stanley Park and the Lions Gate Bridge are central in this view. Source: Slide 6 from City Planning Department archives, microfiche copies, chronological set, 137-F-2 1960 B1469. Courtesy of the City of Vancouver Archives. “The Vancouver Sun’s files are brimming with stories about politicians and planners who wanted to build all sorts of freeways and transit systems, but failed. Some of the plans look interesting, others are simply nuts. . . .
“The most mind-boggling plans were for the freeway systems in the late 1950s and 1960s. If they had been built, Vancouver would have been a very, very different place. “The wackiest proposal was to build a giant trench through downtown. . . .
“A 1960 drawing of the big ditch at Comox and Thurlow shows a dizzying complex of roads and cloverleafs. Try to imagine the Trans-Canada Highway in Burnaby plopped down in the middle of the West End, only bigger (it was eight lanes wide, and 10 metres deep). “It’s hard to imagine what the ditch designers were thinking. They planned bridges — bridges! — on Nelson, Barclay, Haro, Robson, Georgia and Hastings streets . . . .
As built, the Trans-Canada Highway gives downtown Vancouver a wide berth, crossing the Burrard Inlet further inland. A cloverleaf just south of the bridge finds itself in an industrial area, rather than in the middle of town. But in Auckland, the equivalent downtown bridge and motorway nexus didget built. (NB motorway and freeway mean the same thing, one a UK/NZ usage, the other US/Canadian). 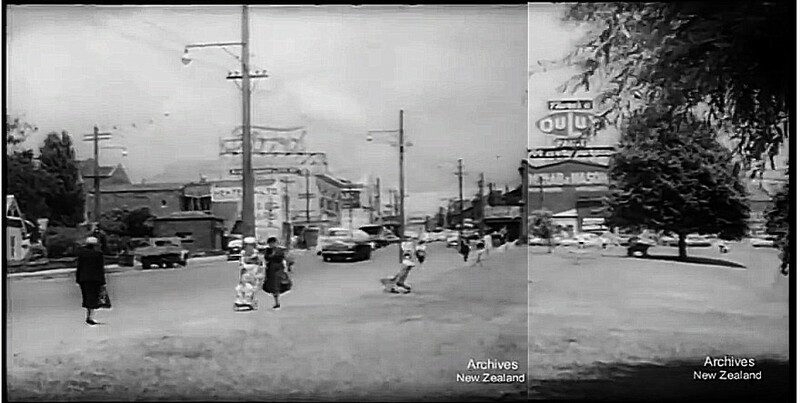 In the 1940s, planners intended that New Zealand’s main national highway should cross the Waitematā harbour well inland of downtown Auckland. However, in the 1950s, the decision was taken to build the main road bridge downtown. Open for traffic in May 1959, the downtown Auckland Harbour Bridge was initially four lanes wide, one more than Vancouver’s Lions Gate Bridge. But during the 1960s, the Auckland Harbour Bridge was widened to eight lanes of motorway. This stimulated the development of a colossal motorway junction, bigger than any in the neighbouring, much larger country of Australia (!)). 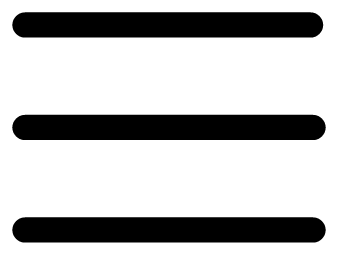 In fact, it resembled nothing so much as what had been originally planned for Vancouver. However, because everything started out narrow in Auckland and then got widened, the Aucklanders were not told upfront what they would actually get. This was not what happened! In fact, large areas of precious inner-city parkland were either paved over or severed from the central business district. 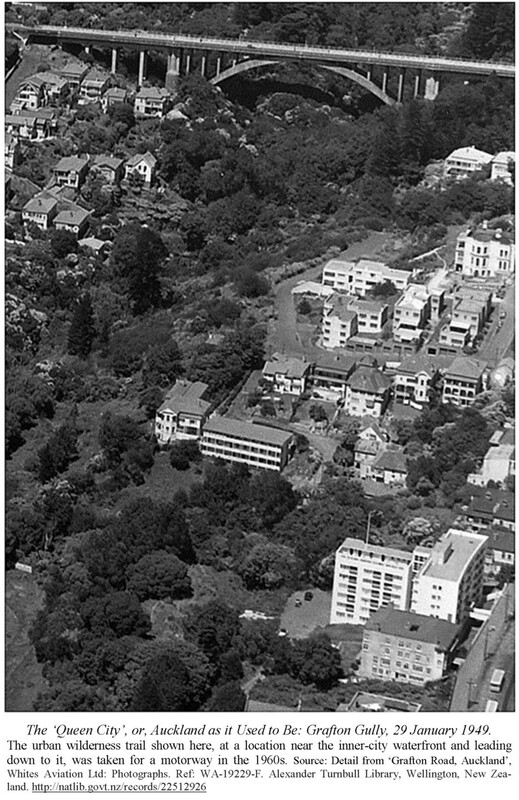 Image of Upper Symonds Street from ‘Expanding Auckland’, Pictorial Parade №98 (1960), a composite of two frames recorded in the course of a moving camera pan from left to right, shows a park in Upper Symonds Street which was entirely excavated to create the current Symonds Street bridge over the motorway trench. Symonds Street Bridge over motorway trench, today. The building with the Ford sign in the 1960 newsreel appears blue in this modern Google image from similar but more elevated viewpoint, looking southward. Imagery ©2018 Google, DigitalGlobe, Landsat/Copernicus, Data/SIO, NOAA, US Navy, NGA, GEBCO, CNES/Airbus, Map Data ©2018 Google, Map DataSciences Pty Ltd, PSMA. Photo reproduced from A Maverick New Zealand Way, with caption and acknowledgements as in the book. Auckland’s Grafton Gully today, looking southward. Imagery ©2018 Google, DigitalGlobe, CNES/Airbus, Data SIO, NOAA, US Navy, NGA, GEBCO, Landsat/Copernicus. Map Data ©2018 Google, MapData Sciences Pty Ltd, PSMA. As the late Australian urbanist Paul Mees wrote in his book Transport for Suburbia (2009), New Zealand’s environmental concern has not extended to its cities! In spite of its beautiful natural setting, Auckland has been trashed by motorways. A massive downtown motorway junction in Auckland is the bullet that a similarly scenic Vancouver dodged. In Auckland, you can see Vancouver as it might have been. And in Vancouver, you can see Auckland as it might have been. There is also a similar if less exact parallel to San Francisco in California. San Francisco is a coastal city where plans for a massive downtown freeway interchange were also resisted; and where some flyovers that were built were torn down after the 1989 Loma Prieta earthquake, and not replaced. Thus Auckland is also to some extent San Francisco as it might have been — and vice versa. Returning to happier parallels, both cities have an amazing endowment of wilderness right on their doorsteps. There are many contenders for the title of the jewel in Auckland’s crown, with most favouring the sheltered eastern coast. But others prefer the windy west, with its leathery vegetation and black-sand surf beaches. 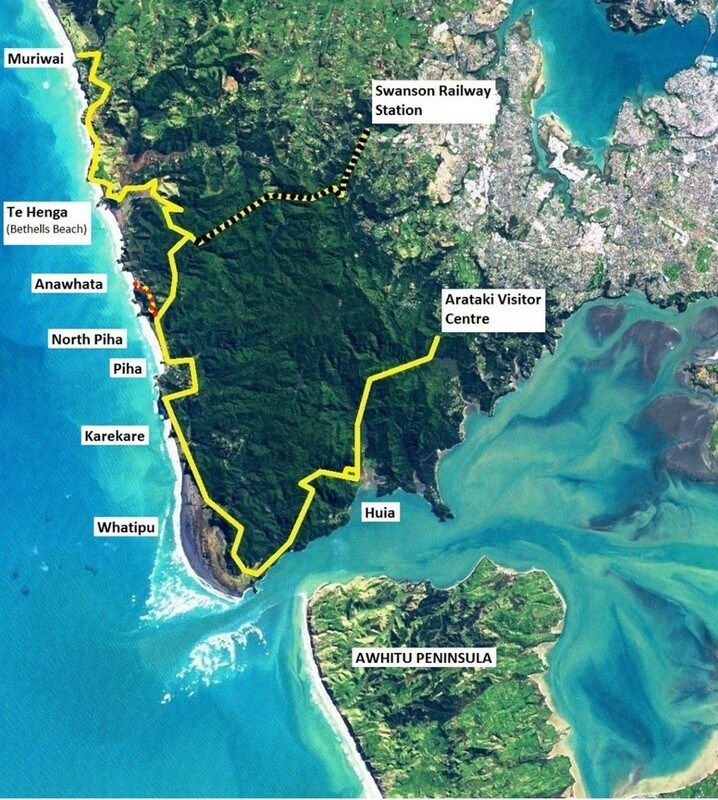 And, in particular, the vast Waitakere Ranges, which form the north head of the Manukau harbour entrance. At this point in a tour around Auckland, another parallel to San Francisco suggests itself. If on a misty night Vancouver is just like Auckland, so the Manukau Heads bear an uncanny resemblance to San Francisco’s Golden Gate. But there is no bridge across the Manukau Harbour; and no city by its dramatic entrance. Indeed, this wild western extremity often seems as empty as in The Piano, despite its current proximity to a city of a million and a half. From Auckland, the Manukau Heads are reached most easily from the western suburb of Titirangi, already under primordial forests that stretch to the sea. Under these, it’s possible to walk a complete loop from Titirangi to the sea and back to another suburb via the Hillary Trail, named after the mountaineer. Or at least it was, before the issue of kauri dieback diseaseforced some long-term track closures, with perhaps more to come. 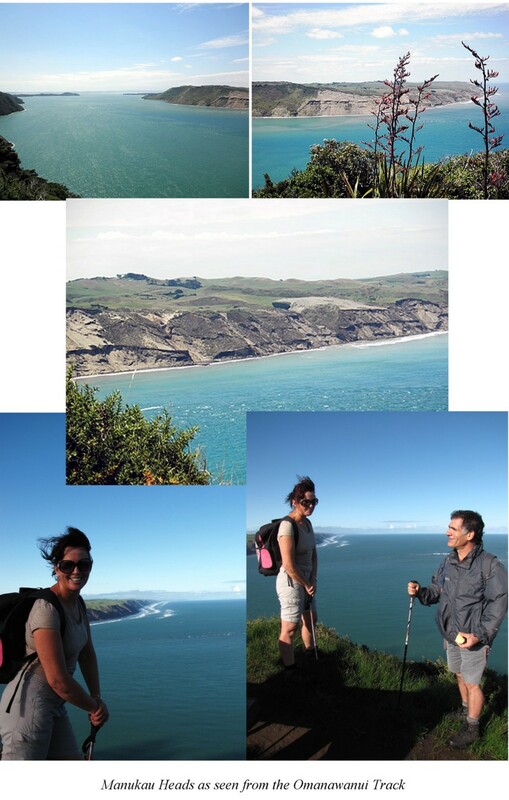 Auckland’s Hillary Trail and its environs, as shown in A Maverick New Zealand Way. Satellite photography is from NASA Earth Observatory Image Auckland_17_2002239. North at top. 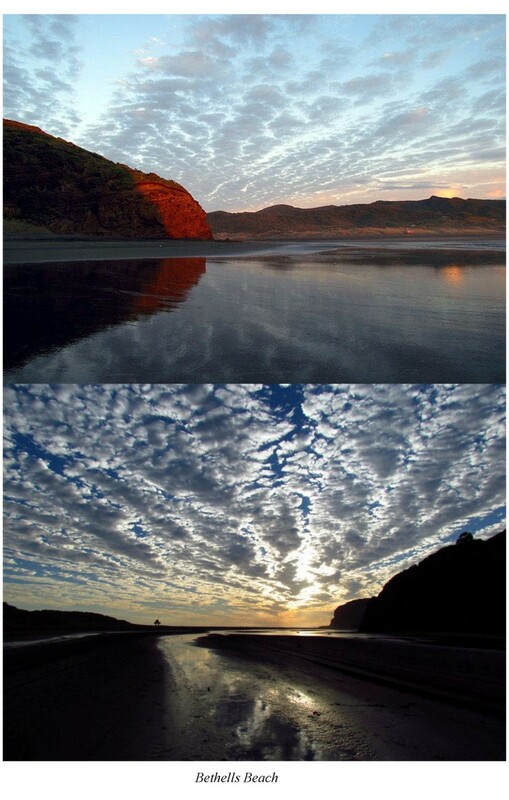 West of Auckland: Anawhata Beach, collage from A Maverick New Zealand Way. Photos by Nicki Botica Williams, of Auckland. West of Auckland: Bethells Beach / Te Henga, west of Auckland. Collage from A Maverick New Zealand Way. Photos by Nicki Botica Williams, of Auckland. 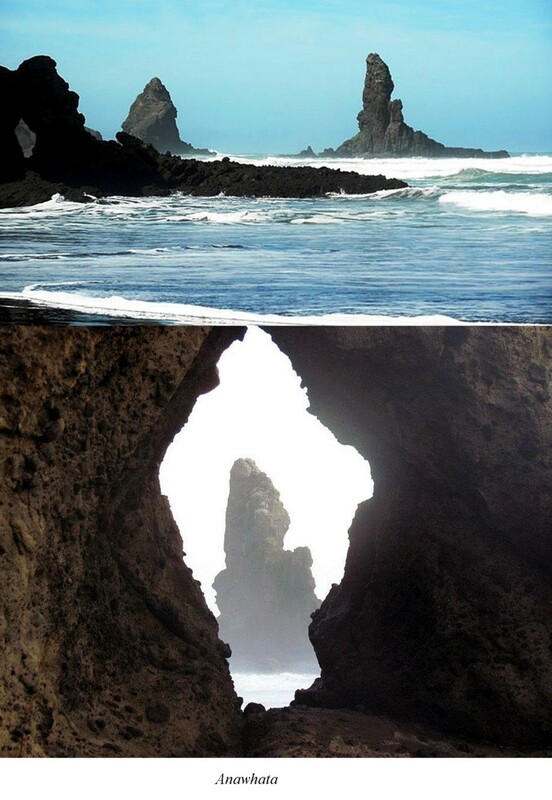 The Hillary trail offers the best view of the Manukau Heads, and also visits several west coast beaches, including Karekare, where the piano came ashore. Sadly, to repeat a point I had to make above, the kauri dieback disease, an introduced pest, is starting to limit visitors’ access to the western forests, and access may be restricted further in future. Although many tourists come to New Zealand, they often head straight for the remote wilderness and miss out on Auckland. In fact, Auckland is an interesting place with many parallels to cities of the North American west coast. It’s also just as old and historical, if not more so in a number of ways. Auckland was founded in 1840, as the first proper colonial town and seaport in New Zealand. This makes Auckland a few years older than Seattle, Portland, or any Anglophone settlement in California, and about forty-five years older than Vancouver. In fact, Auckland is only a few years younger than Chicago. Auckland’s strong indigenous culture stretches back further. Over fifty green volcanic hills in greater Auckland, many of them terraced by Māori to make them into more useful strongholds have now been submitted for the first step on the road to World Heritage status. And that’s as good a place as any to round off what is, of necessity, a very quick introduction to an unreasonably neglected city, skipped through by tourists and treated in a cavalier sense even by New Zealand’s own Wellington-based bureaucracies. Yet Auckland is clearly a city of some interest, with its own attractions and with many curious parallels to cities and districts in the US/Canadian West Coast, as well as points of difference. Notes: The 1950s quote in which Vancouver is said to resemble Auckland on a misty night is by Peter Blish, as published in The Weekly News (NZ), 29 April 1953, p. 22. The Vancouver Sun article by John Mackie is ‘What Might Have Been’, published 19 January 2008 but written before the New Year.